It’s more fun to take the bus in Venice, because it’s actually a boat (called the Vaporetto). Since they’re used by locals and tourists, it can be very crowded (and therefore not always so fun, or even safe for those with mobility issues). But today we got on our first Vaporetto of this trip, and we scored the coveted outside seats! I couldn’t believe our luck! Mama and I enjoyed a lovely ride all the way to other end of Venice, where we applied for Venezia Unica cards, which allow us to get a monthly pass to ride the Vaporetto. A kind agent named Federicka helped us complete the forms, which were in Italian, and she even transferred the leftover rides from our outdated cards (iMob cards, for our fellow Venetophiles). 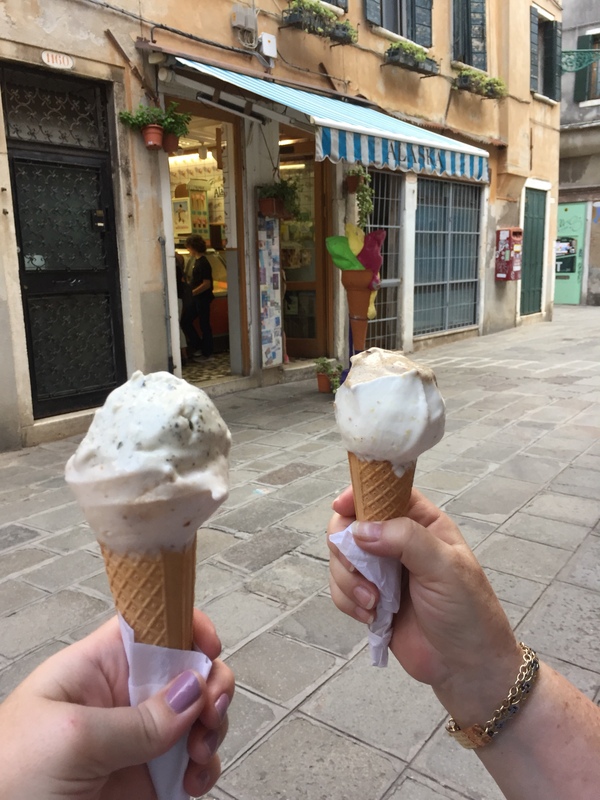 Having accomplished the day’s main goal, Mama and I decided to wander our way in the direction of home by way a of gelato shop she’d been to many years ago. We were thrilled to find several lovely smaller bridges with ramps along the way. And then, when we were eating our gelato, we met another Boston Terrier. He’s called Mocha, surname Espresso, and he couldn’t get enough of Paisley! On our way to take the Vaporetto the rest of the journey home, we met a charming couple, who happen to live less than two hours drive from us back in California. We’d been chatting with Robin and Don on the street in front of a restaurant when our friend Elisa walked past. Mama and I ended up going inside for a spritz with Elisa, and after their pre-dinner walk, Robin and Don joined us all. They had dinner reservations at the same restaurant and so we shared a table and our life stories over glasses of wine. We found we had so much in common and look forward to seeing them back in the Bay Area! 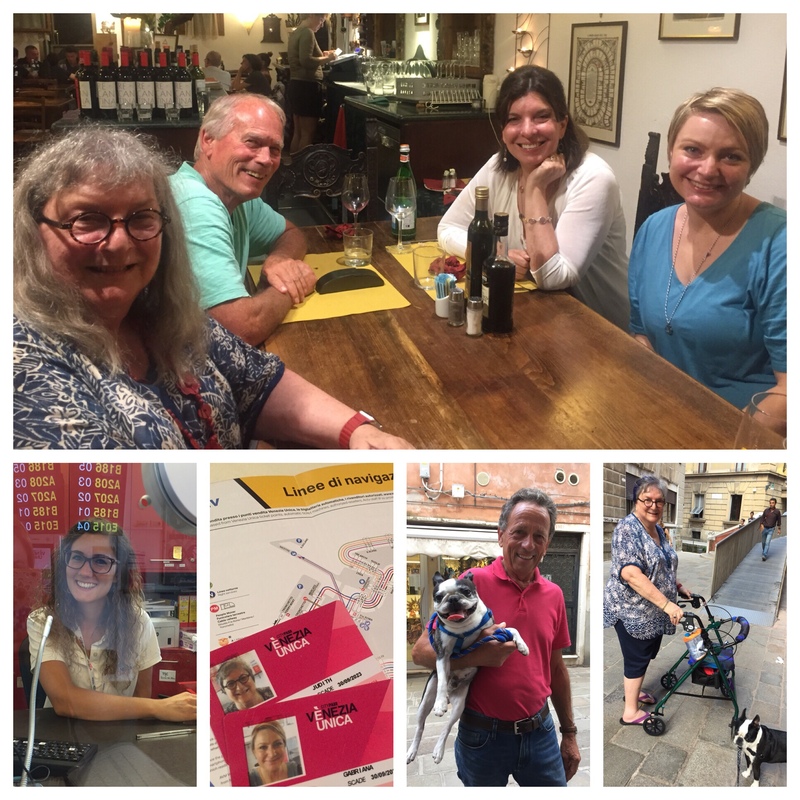 Today’s #OneGoodThing was getting water bus passes and making new friends in Venice with Mama! Day 261 of 365. And Day 992 in a row (here’s the first 366 & the following 365)!